The St. Francis Woman’s basketball team won two out of the three games played this weekend during the Vinewood Farm Classic held at Morehead State University. They started off playing their first game on Friday with a 110-73 win over Chicago State University. 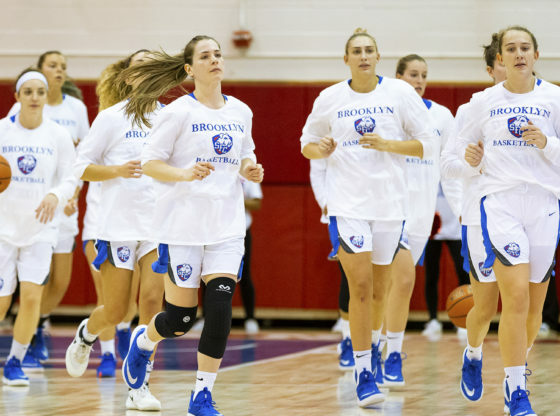 Many of the Terriers contributed in this win as freshman Kate Bauhof led the team with 18 points and 3 rebounds, senior Amy O’Niell finished with 17 points and 11 assists, freshman Ebony Horton ended the game with 16 points and 3 steals, sophomore Ally Lassen ended with 15 points and 6 rebounds, red-shirt junior Mia Ehling finishing with 13 points and 3 rebounds, and sophomore Abby Anderson finishing with 10 points and 8 rebounds. The Terriers then went on to play their second game in the Vinewood Farm Classic as they fell short to Valparaiso University in a score of 78-76. Junior Jade Johnson ended the game with 24 points (6-14 FG, 6-12 3pt, and 6-7 FT) along with 2 rebounds and an assist. Senior Maria Palarino finished with 16 points, 9 rebounds, and 2 assists. They wrapped up the weekend and the Vinewood Farm Classic with a 101-94 win over the hosts, Morehead State University. Junior Jade Johnson led the team with 27 points (season-high), 2 rebounds and an assist. Graduate student Dominique Ward finished with 18 points and 7 rebounds (season-high). Freshman Ebony Horton ended with 17 points (career-high) and 3 rebounds. Senior Maria Palarino ended with 17 points, 5 rebounds, and 5 assists. Although the Terriers have only played 5 games in the season so far, they are already making history within the school’s program. The team has scored over 100 points three times in their first five games of the season. Prior to this season, the Terriers had never scored over 100 points in a single-game. The Woman’s basketball team are now 4-1 in the season and this is their best start to a season since the 2013-14 season. The next game that they will play will take place on the road again this Sunday, November 25that 1pm against Seton Hall University.